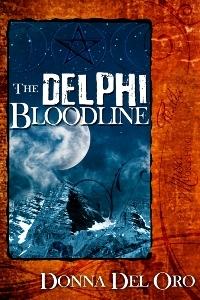 THE DELPHI BLOODLINE: A smart, romantic thriller about an ancient bloodline of psychic women, the ruthless tycoon who wants to enslave them, the mysterious man who wants to protect them, and the modern-day descendant who must fight to stay alive and free! Annabella, you speak several languages and have lived in a variety of places. What’s your background? Annabella: I’m Italian by birth, once married to a Brit, now an American. I grew up speaking Italian, French, German and later learned English. And I have dual citizenship in Great Britain and Italy. My mother is Italian-Swiss, as her mother before her. We are all heirs of the Delphi Bloodline. My daughter, Athena, and son were born in England but now live in San Francisco. Because of your close friendship with Bishop Bulgari, you have contacts with the Vatican. Can you comment about that unusual relationship? Annabella: Bishop Bulgari believes, as I do, that our bloodline’s gift is from God. The Holy Father has occasionally asked me to read for him, and so I consult with the Vatican now and then. The Vatican Security Police ask me to inform them if there are any dangers that I can foresee in the Pope’s travel plans. At one point in the story, I advise him to change his plans to go to Beirut. Let’s talk about your beautiful daughter, Athena. She’s the modern-day descendant of the Bloodline. What have you taught her, growing up with the same psychic gifts that you have? Annabella: I have taught her to use our connected telepathy for our “Night Visits”. When we’re on different continents, we can stay in touch with these telepathic visits. I’ve also taught her to keep a CLEAR MIND, STRONG HEART and a TOUGH SKIN. Inheriting the Bloodline’s gifts is a daunting responsibility and comes with a certain amount of danger. There are always people or organizations that want to stop us from using these gifts. What other ways have you used your gifts? Annabella: I have consulted with various police departments in trying to locate missing and abducted children. The Baltimore PD has asked me for their help in stopping a serial killer of children, and while doing this, a group that means me harm tried to abduct me. That’s why Athena and I try to keep a very low profile. Does this always work for you? Keeping a low profile? Annabella: No. At a White House dinner party, I made the mistake of allowing my American husband to talk about my Bloodline and me. Our unusual psychic gifts. That’s when the latest problems started. I’m sorry for that. Thank you for your time and good luck!